Made these for my Granddaughter. 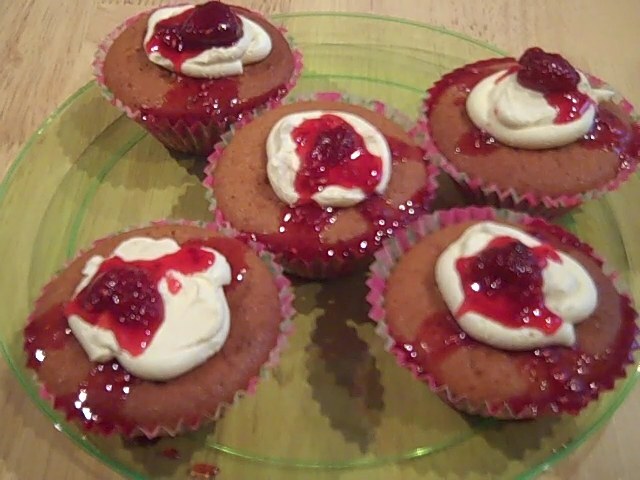 Putting the raspberry jam directly into the mixture makes the cupcakes look pretty when cut open. You could decorate them with fresh raspberries. 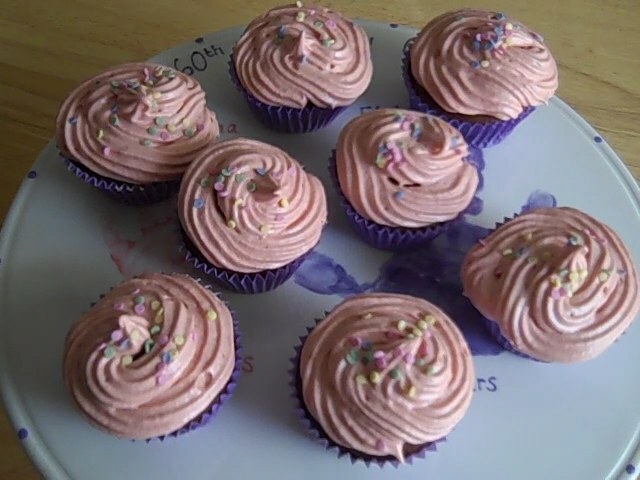 Preheat oven to 190C/375F/gas mark 5 and line your cake trays with cupcake cases. In a bowl cream the butter and sugar until pale and smooth. Add the eggs, one at a time, mixing for a few minutes after each addition. Add one third of the flours to the creamed mixture and beat well. Pour in one third of the milk and beat again. Repeat these steps until all the milk and flour have been added. Gently fold in the raspberry jam until most of it is combined. 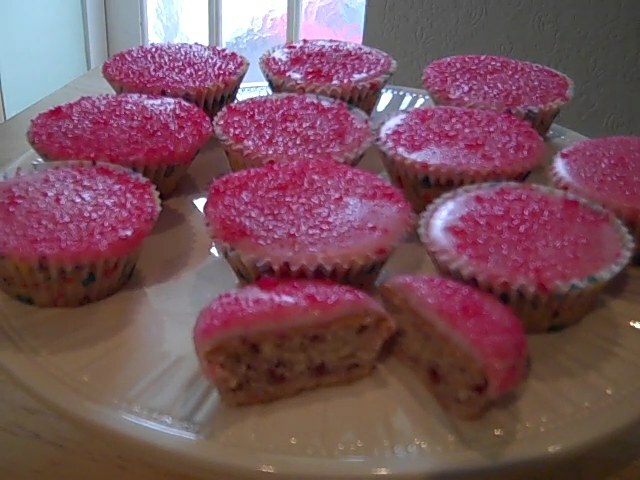 The idea is to have some jam streaks running through the mixture, rather than an evenly coloured mixture. Spoon the mixture into the cupcake cases, filling them to about two thirds full. Bake for about 20 – 25 minutes until slightly raised and golden brown. Remove from the oven and leave to completely cool on a wire rack. In a bowl, put the sifted icing sugar, add 1 Tbsp of water and a little food colouring and mix well adding more water and colouring as needed. Only ever add the colouring a little at a time. You need this to be just pouring consistency. Spoon over the cakes, smoothing it over with a teaspoon, then just before it set’s dip the cakes into the sugar sprinkles.